Last week Juventus beat Milan for the second time this season. Now they face Cesena, a step down from Milan – though those words mean much less now than they did five years ago – and the first of their remaining two Serie A games before the first Champions League fixture versus Borussia Dortmund. Stephan Lichtsteiner’s suspension is over, but Carlos Tevez is suspended for this game due to yellow card accumulation. Tevez is Juve’s best striker so his loss will hurt. Gianluigi Buffon will start in goal. With Lichtsteiner back we are likely to see the 4-3-1-2. Allegri has his preferred starters and there is no midweek game, so expect to see Leonardo Bonucci and Giorgio Chiellini in the middle of the backline with Patrice Evra at left back. Paolo De Ceglie gave an interview to JTV, so Juventus is acknowledging his existence, perhaps he could be on the bench. The preferred midfield is Andrea Pirlo at regista, Claudio Marchisio and Paul Pogba in the middle, and Arturo Vidal as a sort of attacking midfielder. Gazetta dello Sport are predicting Pirlo on the bench and Roberto Pereyra starting. If this were to happen, most likely Marchisio would play in Pirlo’s role, and Pereyra would play alongside Paul Pogba in central midfield. However, Pirlo is healthy so it’s quite likely he could start. Finally up top with Carlos Tevez out, Allegri will obviously go with a duo of Alvaro Morata and Fernando Llorente. Llorente has been rather mediocre lately, but Morata has been getting better as the season has gone on. It will be interesting to see how they play together. As it stands, Cesena is the second “favourite” for the relegation as they occupy the penultimate position of the table with 15 points, four clear from Cagliari and six from Chievo Verona. The battle to avoid relegation is heating up and Cesena need to close the gap in the next few match days to at least stand a chance in the final decisive games. They are desperate for points, but I’m not sure they have enough quality to compete with Cagliari, Chievo Verona, Atalanta, Empoli and Hellas Verona, which look either more organized or more well-equipped. Domenico Di Carlo took over in December at the expense of Giampaolo Bisoli and he has so far collected two wins, one draw and four losses in seven matches. An average of one point per match that is probably not good enough, they need to turn it up a notch. He has tried different lineups and he has found some relative success with a 4-3-1-2 that allows having the two best playmakers on the team, Gregoire Defrel and Franco Brienza, and a reference point for the long balls from the defense, Milan Djuric, on the pitch at the same time. While they have been somehow watchable on offense, the defense has been a nightmare: they have conceded 43 goals so far, bottom of the League. They have trouble defending in the set pieces, they allow too many shots (15 per game) and they don’t have an adequate offside trap. Di Carlo has tried multiple combinations of the many centre-backs he has a disposal: the talented Luka Krajnc seems to have clinched a starting spot, we’ll see whether he’ll partner up with either Daniele Capelli, Stefano Lucchini or Massimo Volta. Gabriele Perico has started the most recent games at RB, but it’s always possible that the coach will opt for a more defensive option, like shifting Capelli at right-back. The left-back Francesco Renzetti has been one of their best performer so far, but he’s questionable due to a sore ankle: Hordur Magnusson would probably replace him if he was unable to go. They do have a large roster, but they just lack quality. In the injury-plagued midfield, the most likely trio is Luigi Giorgi-Giuseppe De Feudis-Zè Eduardo (or the disappointing Carlos Carbonero): hard-working players for sure, but not very good passers/creators. They added Gaby Mudingayi, who’ll bring some veteran leadership and muscles. Their only concrete hope for salvation is Defrel: a very athletic second-striker who has amazing tricks in his bag and can single-handedly take over a game. Guarding him closely must be the primary task for Juventus’ defenders. Djuric has proven to be a handful for the opponents from the physical standpoint, but he has scored only a goal so far. They have won only three games in this season, but, rather surprisingly, two of their victories came in the last three games. The home win against Lazio two weeks ago is a legit exclamation point. They are trying to gain some momentum ahead of the final sprint. 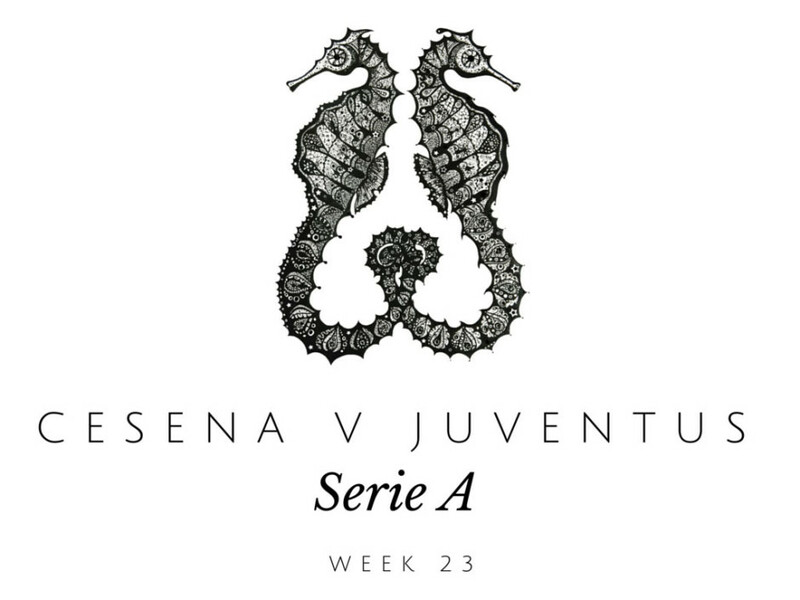 In the first match between the two teams, Juventus easily toppled Cesena: 3-0. 4-3-1-2: Leali; Perico, Capelli, Krajnc, Magnusson; Giorgi, De Feudis, Ze Eduardo; Brienza; Defrel, Djuric. Marilungo (thigh), Cascione (knee), Pulzetti (thigh), Tabanelli (foot), Cazzola (calf), Valzania (thigh).